When looking for a round that performs well in their rifle, it is common for people to try several different boxes of factory ammunition. However, it doesn't take 20 rounds to determine if it is one your rifle likes. Often, it only takes three rounds to decide that it’s not the one that your rifle likes. Then, what do you do with the other 17 rounds in the box? Another down side to this approach is that to get a truly accurate round you may have to compromise on bullet selection. Our approaches allow you to find the BEST LOADING for your specific rifle - without waste - and using the bullet of your choice! When you order a Sample Pack, we send you 40 rounds loaded with the same bullet (of your choice), but 4 DIFFERENT LOADINGS (10 of each loading). Ten rounds are plenty to determine which load works best in your rifle. Again, all of the rounds are loaded with the bullet of your choice so there is no compromise on your preferred terminal ballistics. We vary other aspects of the load to change the harmonic vibration of your barrel. Once you have selected the best load from the Sample Pack, you let us know which it is and you will be able to order the exact same load from then on. We keep all of your load data and can reload your brass or manufacture additional new rounds! This is the best way to get the most accuracy out of your rifle. Send your rifle to us and we develop the test loads for your rifle and then do all of the testing at our range. This gives us the ability to experiment with more than four test loads like in the Sample Pack process. In most cases, we can achieve 0.5 MOA (1/2 inch at 100 yards) groups in stock factory rifles. Nice, representative Catskill Mountains black bear taken with Precise Ammunition in a Winchester Model 70 Super Grade chambered in .300 Ultra Magnum with a Berger 190 grain Hunting VLD leaving the muzzle at 3,150 fps. 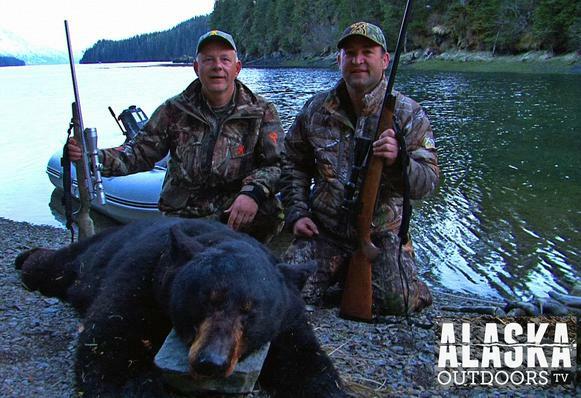 Rob Stone (on right) hosts Alaska Outdoors TV on the Outdoor Channel! 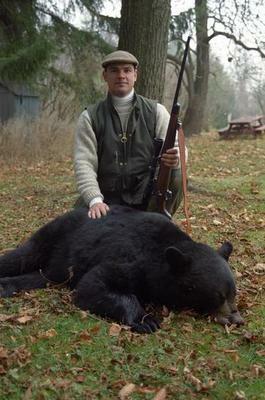 His black bear was taken with a .300 Winchester Magnum shooting Precise Ammunition loaded with Barnes TTSX 180 grain bullets leaving the muzzle at 3,000 fps. This loading produces 3,500 ft/lbs of energy at the muzzle! It did the job on Blackie! Precise Ammunition can reload your brass which not only saves you money, it is also another way of enhancing accuracy. This is called “fireforming” – which shapes the brass to the exact size and shape of your rifle’s chamber! The best competitive shooters in the world use brass that has been fireformed to their rifles chamber. So, send us your fired brass to load! We clean and resize it depending on its intended use. Be aware that brass that will be used in a different rifle than the one it was last fired in must be full length resized. For best accuracy, we recommend that the brass you send is from the same manufacturer and, preferably, the same lot number. We do not recommend shooting neck-sized brass in hunting or tactical applications because it is usually more difficult to chamber. Click on the "BUY Ammunition" link at the top of the page to go to our online store to select your cartridge, brass manufacturer, and bullet to get current prices and availability. Or, send us an email or call! Thanks again for your visit to our site!